Tropical Triple Threat Fun all rolled into one bow! 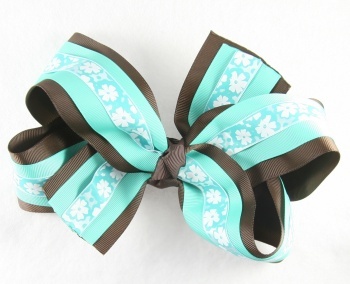 This is a triple layered bow that has a 2.25" Chocolate brown ribbon on the bottom, then a 1.5" tropical blue in the middle. The top layer is a satin 5/8" tropical blue that has white and tropical blue flowers all over. There is blue shimmering sparkles in the middle of the flower to help this shine. This will make her feel like she is ready for some Tropical Fun!